SrA Bradley Smith’s unit was ambushed by mortar and machine gun fire, before an IED was detonated. The ambush caused two members of his unit, one critically wounded and one mortally wounded, to be stranded in a nearby creek. Risking his own life, Bradley ran through the crossfire to rescue the men, providing first aid to the critically wounded soldier that saved his life. Afterwards, he continued coordinating close-air support before attempting to recover a second mortally wounded soldier. Bradley, and another soldier, went to recover the second mortally wounded soldier, almost making it back to the rally point before a second IED detonated, killing both Bradley and the other soldier instantly. Born on September 11th, 1985 in Little Rock, Arkansas, Bradley grew up in Troy, Illinois where he graduated from Triad High School in 2004. He worked with the high school newspaper, played football all 4 years of high school and was an active member of his youth group at Bethel Baptist Church. On his 16thbirthday, the 9/11 terrorist attack occurred, leading to his decision to join the military. In 2006, Bradley enlisted in to the Air Force, graduating with honors from basic training. He was sent to Hulburt Field, Florida to complete Tactical Air Control Party technical training before being assigned to the 14thAir Support Operations Squadron at Pope Air Force Base, North Carolina. There, he attended and completed Army Basic Airborne and Air Assault Schools. In 2009, he was assigned to the 10thAir Support Operations Squadron at Fort Riley, Kansas to complete Army Pathfinder School and The Joint Terminal Attack Qualification Course. While in basic training, he met his wife Tiffany whom he married in February of 2008 in Monterey, California. In October of the following year, their daughter, Chloe was born. Bradley was able to spend the first couple months with his daughter, before being deployed to Afghanistan in support of Operation Enduring Freedom in December of 2009. Bradley is remembered for being an incredibly selfless person, serving because he believed it was necessary to protect freedom. In addition to his wife, Tiffany, and daughter, Chloe, Bradley leaves behind his parents Gary and Paula Smith, and his older brother, Ryan Smith, an airmen who has also been deployed in the War on Terror. SrA Bradley Smith was 24 years old from Troy, Illinois. 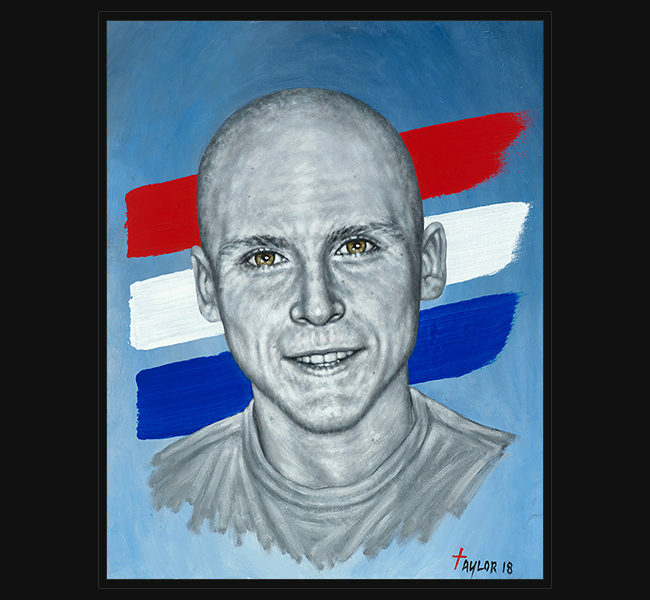 The original portrait was delivered to his wife, Tiffany, daughter, Chloe, and parents during the 2018 TACP Association Memorial Reunion held in Colorado Springs, Colorado on August 10, 2018 .